Screenshot from an undercover video by Animal Aid investigating Bowood Abattoir. Nigel Farage’s decision to back a ban on slaughtering animals without stunning them was not aimed at Jews but was meant to target ‘others’, a UKIP MEP sought to clarify. Agnew’s comments follow UKIP’s announcement on Tuesday that it would back a ban on non-stun slaughter, accusing the government of being “weak” and “lazy” on the issue. Religious slaughter has been in the spotlight this week after Animal Aid published an undercover video on Tuesday documenting scenes of cruelty in a halal abattoir in Yorkshire. 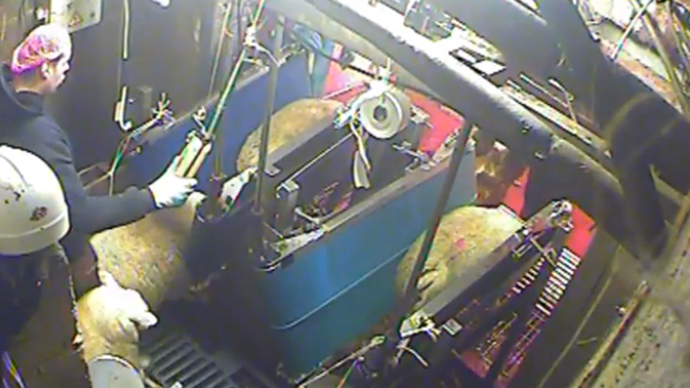 The four-minute video, which was filmed inside Bowood slaughterhouse last December, includes graphic scenes of workers kicking half-conscious sheep in the face, jumping up and down on them, and hacking at their throats. Most abattoirs are required by law to stun animals before they are killed, but Muslim and Jewish slaughterhouses are exempt on religious grounds. Politicians and the public reacted strongly to the video, with over 100,000 people signing a petition to end non-stun slaughter on the government’s e-petition website. Sir Roger Gale MP, a former vice-chair of the Conservative Party, called for government action. “This highlights the very real concern over halal and kosher slaughter. My impression is that all political parties have fought and fight shy of addressing the issue because of the concern not to upset certain faith groups,” he said. “We should bite the bullet and legislate if necessary and simply say point blank there will be no ritual slaughter without pre-stunning,” he added. UKIP announced a surprise U-turn on its policy toward non-stun slaughter by calling for its ban on the same day the abattoir video was released. Party leader Nigel Farage had previously expressed tacit support for protecting the legal exemption held by religious groups. In a statement, UKIP said it supported the British Veterinary Association (BVA) and leading animal-rights charity RSPCA in calling for a ban on non-stun slaughter. While the party respects religious groups, it would not allow the rights and demands of those religions to “override the UK's compassionate traditions of animal welfare,” it said. Following criticism from Jewish groups, Agnew said the policy wasn’t aimed at the community. Agnew failed to clarify who the “others” are, but instead said the U-turn was made to attract more votes ahead of the general election in May. Shimon Cohen, campaign director of Shechita UK, was damning in his criticism of the party. “By joining the campaign to prioritize 'animal welfare' over the rights and beliefs of the UK’s faith communities UKIP has returned to the fringes of mainstream politics,” he said.